The best time to assess your turf’s state of health is before mowing. As you pick up fallen twigs or remove other items from the lawn, you should take a careful look at any areas that appear wilted, off-color or stand out from their surroundings. If you do note changes, it might not be disease. For instance, brownout of a cool-season grass during high summer is likely just summer dormancy, which is the grass’s protective response to drought and heat. Dull, wilted, bluish gray turf is the grass’s signal that it needs water, and general yellowing and stunted growth may be a lack of iron or nitrogen. Also, ragged leaf tips and a whitish cast usually indicate that your mower blades need sharpening. You should also consider the recent kinds of activities that have occurred in your yard. Perhaps the bright green rings surrounding dead grass are courtesy of the neighbor’s dog, and the brown patches near the garage could be the result of a gasoline spill. While problems, these eyesores are limited in scope and can usually be rectified with fertilization, irrigation, or spot reseeding. If you cannot explain your turf’s decline by such causes, then look more closely for a possible disease problem. 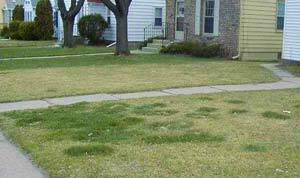 To keep your lawn healthy stick to basic management practices rather than chemical solutions. A healthy lawn means paying attention to mowing height, aeration, drainage, irrigation, and fertilization. Coupling these practices with the use of suitable grass cultivars and healthy soil will give your lawn an advantage over the harmful microorganisms normally found in most yards. Choose recommended grass-seed mixtures. If lawn disease does develop, it will not affect all grass types. Look for improved or disease-resistant cultivators when renovating or starting new lawns. Water your lawn early in the day, from sunrise until 11 a.m.
Water only when needed, and to a depth of 6 to 8 inches. Maintain adequate lawn aeration and drainage. Never cut off more than one-third of the grass length at one time. Keep thatch to a ½-inch in height. Apply appropriate fertilizer, and correct nutrient deficiencies, especially calcium deficiency. Increase air circulation and sunlight exposure by pruning and thinning trees and tall shrubs. It takes 3 factors to be in place before lawn disease can develop. Learn more here.